Providing 200 square inches of cooking space, this electric griddle cooks family-size meals right on the counter and then goes safely into the dishwasher. The griddle is heavy aluminum for spreading heat quickly and uniformly and is coated with nonstick so pancakes, eggs, burgers, and fish fillets release easily. An adjustable heat control inserts into the griddle's side. It has a dial that adjusts from 200 to 400 degrees F, and the griddle's large, removable drip tray has a guide to cooking various foods printed on its handle. 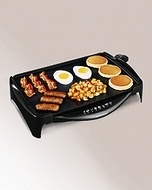 Both the tray and the griddle's attached stand are made of rugged, gleaming black plastic. Depending on availability you might receive Proctor Silex 38509 StepSavor Jumbo Griddle, which has the same features as Hamilton Beach 38510 StepSavor Jumbo Griddle.